Did you know that Melville Cares provides “Foot and Nail Care” services? This service ensures our clients have their feet maintained regularly. Our staff are trained in the service and regularly check client’s foot health and skin/nail integrity. Here is one of our clients Jeanette having this service with Support Worker Karen. 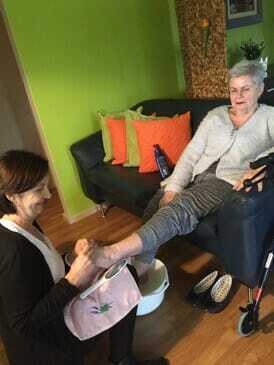 Jeanette states that she really appreciates this service as she is able to have it completed in her own home environment and knows that her feet are well looked after.